Lila (pronounced lee-luh) is a Sanskrit word which literally translates as “Divine play.” In the same spirit of Shakespeare's comment, “All the world’s a stage…,” God weaves opportunities for expansion into every facet of our human experience. Using the narrative of our daily lives, a lila is a vehicle through which a deeper understanding of Divine Truth is revealed. In this section are some of the countless blessings that befall those who open their hearts to receive the bounty of Louix's love. He is known for using the simplest of experiences to touch hearts in the deepest of ways. 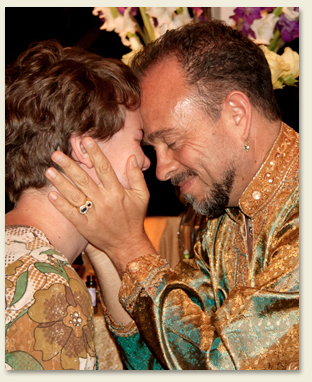 These intimate and miraculous encounters with the Master may or may not occur in his physical presence. Sometimes humorous, sometimes tender—always illuminating—the following stories illustrate the profound simplicity, beauty, and wonderment of his Divine play. Be it a single moment in his company, a glance from his eternally compassionate eyes, or a pearl of wisdom gifted from the treasure chest of his omniscience—all these experiences wield the power to transform your life forever. Each experience is as unique to each individual as would (naturally) be God’s love for all His creations. As you read these lilas, invite Louix into your heart—and into your life, so that you, too, may drink deeply of his love and his blessing. Furthermore, we welcome your stories of love and any of your experiences of Louix that you wish to share.